Preparing for the 100th Anniversary of Fatima? Check this out: Happy Saints Mother Mary eBook! 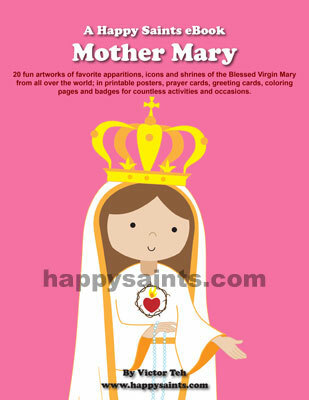 Featuring 20 fun and educational artworks of favorite apparitions, icons and shrines of the Blessed Virgin Mary from all over the world; in printable posters, prayer cards, greeting cards, coloring pages and badges for countless activities and occasions. It is a great resource for your home, church and school during the Fatima 100th Anniversary celebrations, May (month of Mary) and throughout the whole year!